By Adam Harrison Fitzrovia is short of public open space and the situation is getting worse as the working and residential populations only continue to rise. 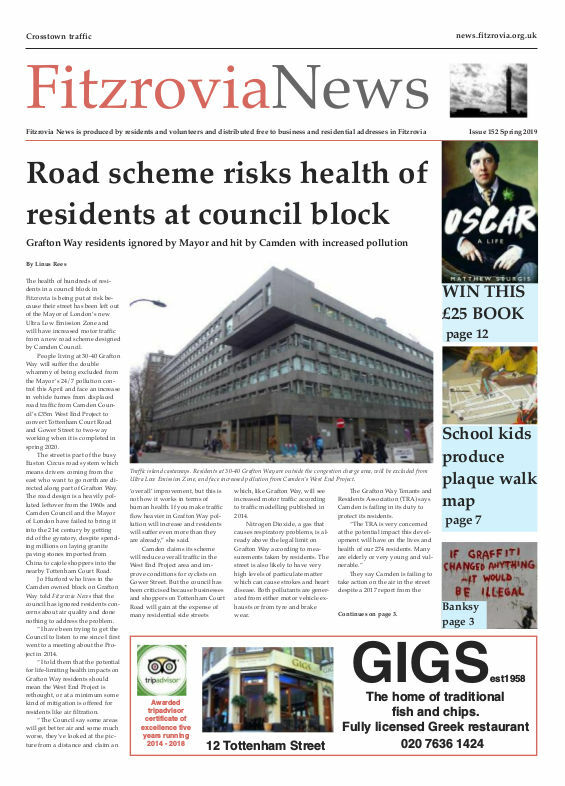 Fitzrovia News readers will be aware of the postage stamp of a park planned for Chitty Street as part of the ‘Saatchi block’ redevelopment, which was turned down by Camden councillors but then approved by the mayor of London. Since the transformation of Crabtree Fields from car park to real park, Fitzrovia has seen no new public open space in a quarter of a century. Part of solving the problem may be to turn Alfred Place, which lies between Chenies Street and Store Street, into some public open space. This would not be a straightforward task – a cycle hire station now sits at its southern end, for example. But as a broad road, already lined with trees down one side, it could provide valuable green space for residents and local workers. With the Friends of Open Spaces Fitzrovia, we can take this forward by setting up a working party to liaise with Camden Council to make this a reality. It has already been identified by a recent study of Fitzrovia’s potential for open spaces as the best prospect for gaining new green space. To get involved, please email alfredplaceparkcampaign@gmail.com or call me on 07584 407 456. Adam Harrison is ward councillor for Bloomsbury.